I have my favourite natural conditioners for blonde hair but I always love to try new products to see whether I discover something better. When it comes to a conditioner I always go for the one which would make my hair slightly lighter as otherwise I have quite dark blonde hair, in winter probably light brown. The ingredients which are known to highlight the hair are lemon and chamomile and this is what I normally look for in conditioners. 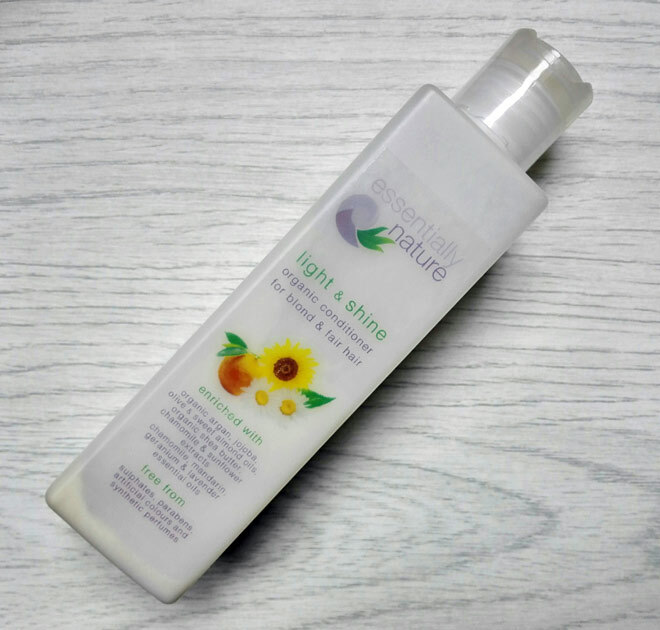 When I discovered Light & Shine conditioner from Essentially Nature I knew straight away that I wanted to give it a try. The name for the conditioner was perfect. Yes, I want my hair to be lighter and shiny if possible! So how did it actually work for me? Was I impressed? First of all, just to mention that this was my first product from Essentially Nature, a British family business which focuses on providing clients with the best quality handmade products. Their products are reasonably priced and free from parabens, sulphates, artificial colours and synthetic perfumes. The ingredients Essentially Nature use are never tested on animals but they don’t have an official cruelty-free certification just yet – this is currently in progress. They are also not certified organic. Their products are suitable for vegans and vegetarians and apart from the haircare products they also do face and body care products. Essentially Nature Light & Shine Conditioner has been designed especially for fair and blond hair (natural and coloured). It has lovely ingredients which help to nourish hair and protect it from damage due to styling and outdoor activities. Sunflower oil helps prevent colour fade and promotes vibrant and shiny hair while Herbal Extract and Essential Oil of Chamomile helps to make hair soft and supple. Organic argan oil removes frizziness in hair, protects it from damage and adds shine. The consistency of Essentially Nature Light & Shine conditioner is slightly thicker than the consistency of conditioners from Faith in Nature. For that reason I feel that I have to apply slightly more of it. The scent is pleasant, nothing stands out too much. After the use, my hair feels really soft and smooth and it looks much better too, flyaways are barely there. 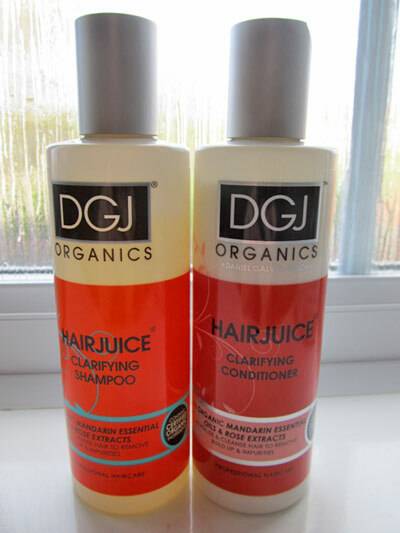 I can actually confidently say that none of the natural conditioners that I’ve tried in the past left my hair feeling so nice (apart from the DGJ conditioner which wasn’t as natural). Unfortunately, this conditioner doesn’t work very well for detangling the hair. This is something I kind of expect from every conditioner but maybe my expectations are too high?? Nevertheless, before I dry my hair I use 4 in 1 Organic Conditioner from Tabitha James Kraan which resolves this issue straight away. When it comes to lightening effect I think some other natural conditioners bring out the colour a little bit more. But maybe if I was using this conditioner together with Essentially Nature Organic Light & Shine Shampoo, then the final results would be better. All in all, Essentially Nature Light & Shine Organic Conditioner is not bad at all. If you are not bothered about detangling and just want your hair to feel soft and smooth, then this conditioner is definitely worth considering. 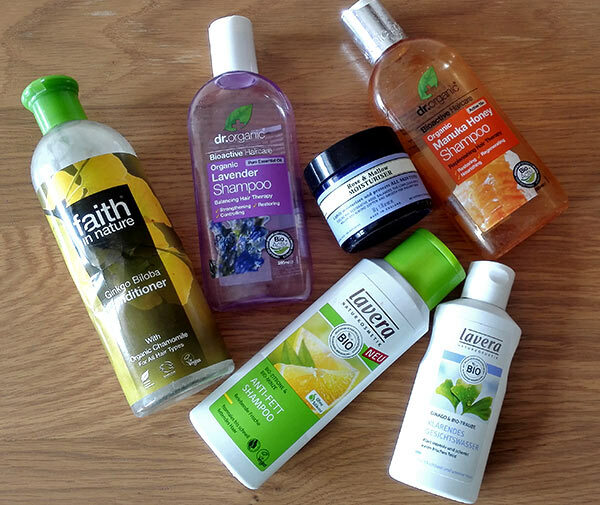 Have you tried anything from Essentially Nature yet? What did you think? Disclaimer: This conditioner was sent to me to review as part of LoveLula Accredited Blogger Programme. This post contains affiliate links (if you make a purchase after clicking on a link I get a small commission). I’ve not tried anything from Essentially Nature before, and I’m always on the lookout for new cruelty free and vegan-friendly brands. I’d be interested in trying out their skincare. Thanks for bringing them to my attention! You’re welcome! 🙂 I would also love to try some of their skincare products as they are really affordable.